July | 2014 | Where's Merrill? 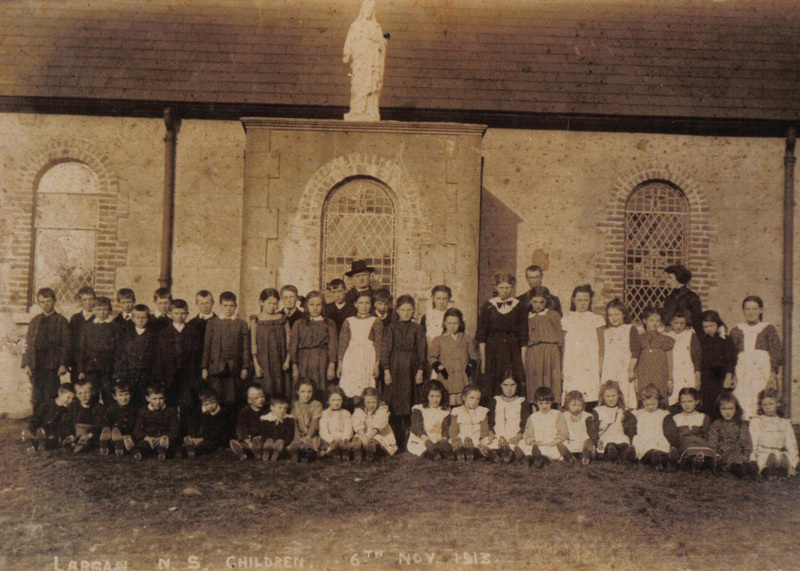 No sooner had I publicized the fact that a very old photo of the (named) pupils of Drimina National School existed, dating from the 1920’s, and not one, but two, even older photos come to light from the relatively small Kilmacteigue RC Parish in South County Sligo. 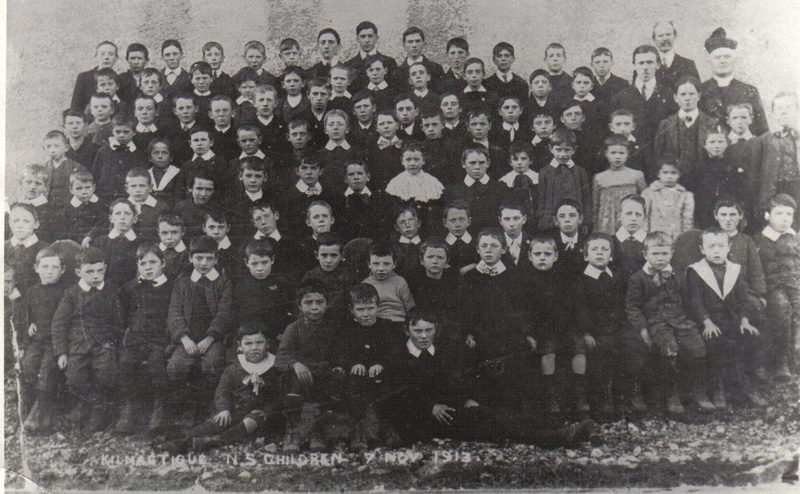 The photo below features the pupils in attendance at the tiny Largan National School overlooking the beautiful Lough Talt in November 1913. As you will see, a name has been put to each schoolchild. Do you know any of these families? 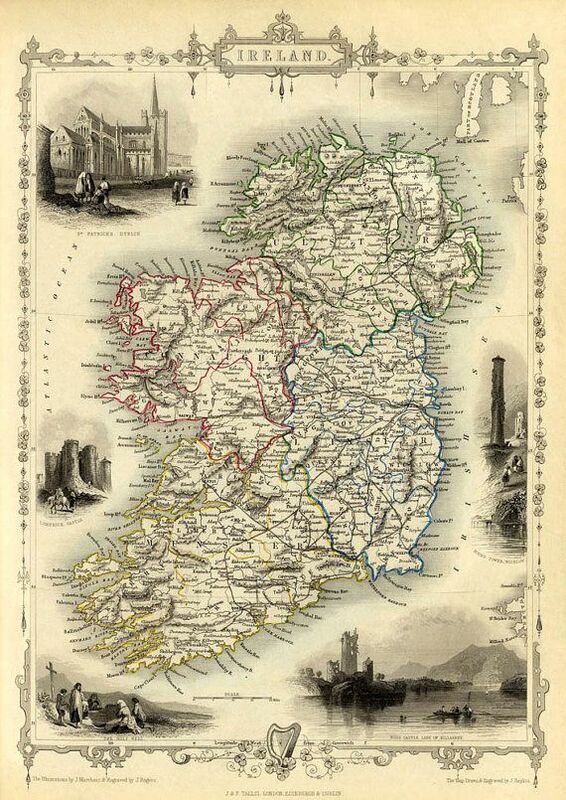 Were they your ancestors? Largan National School – 6th November 1913. Back Row: Joe Murry, Joe Murry, Tom Cooke, Willie Curley, Joe Deehan, Francis Murry, Martin Deehan, Pat Walsh, Joe Gallagher, Annie Cooke, John Henry Murry, Beezie O’Donnell, Mike Curley, Bridget Mullarkey, Jim O’Connor, Mary Kate Cooke, Mary O’Connor, Mary Walsh, Maggie Henigan, Florrie Henigan, Kate Quinn, Delia Quinn, Mary Jane Goldrick, Mary Kate Deehan, Mary Ellen Mullarkey, Kate Mullarkey. Front Row: Martin Quinn, Micheal Walsh, Jim Goldrick, John Lang, Jim Quinn, John William Mullarkey, Mike Quinn, Annie Kate Goldrick, Mary Ann Durcan, Kate Curley, Mary Agnes Murry, Emma Goldrick, Mary Frances Murry, Bridget Curley, Annie Theresa Mullarkey, Maggie Lang, Kate Deehan, Mary Walsh, Kate Kildunne, Maggie Deehan. First off, the formalities. It was our Shankley’s fourth birthday on US Independence Day, yesterday. Straightaway I should point out that Shankley is a pedigree male Bengal domestic cat because a pet named Shankley appears in my genealogical thriller novel “Where’s Merrill?” in a different guise. 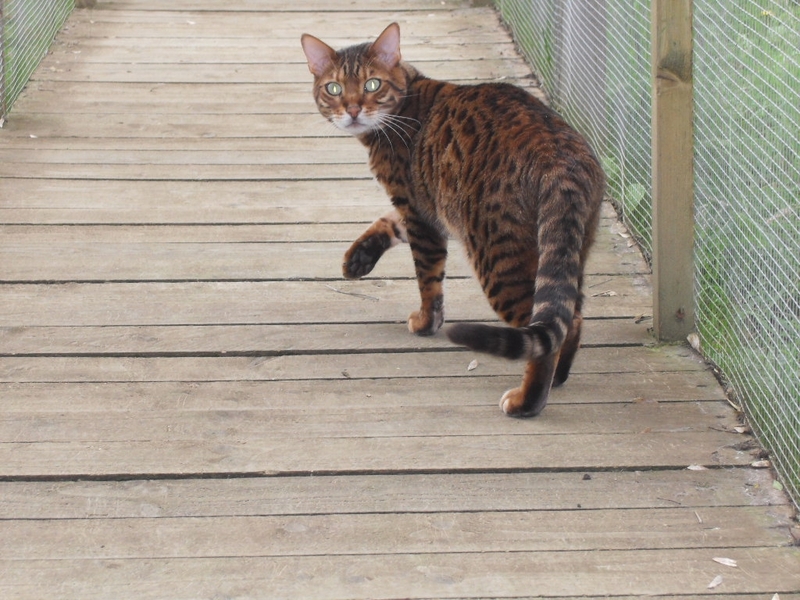 Being a Bengal, Shankley’s 4th birthday is a significant milestone for him. He can now be classed as an adult and he is certainly refraining from starting childish daily play fights with his younger feline house-mates as was his way a year ago. As part of the birthday celebration, we took out Shankley’s birth certificate to respectfully remember his parentage. Yes – pedigree animals have their own birth certificates – and some breeders provide documents which are far better in content than human counterparts. Take a look at Shankley’s birth cert below. Professional genealogists would be obsolete if national authorities ever started to request such detailed information when the birth of a human baby was registered. 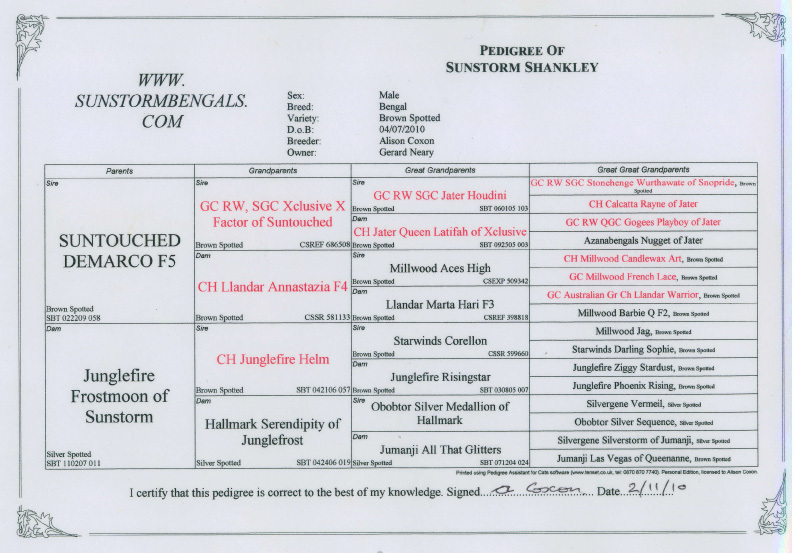 As you can see, the new arrival’s full name of Sunstorm Shankley was registered as the progeny of his named father and mother, termed as Sire & Dam. 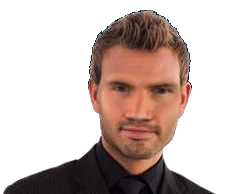 Only a few obscure places in the human birth registration world bother to record an infant’s grand-parentage – but by reference to his birth document, our Shankley can name all eight of his great grandparents, and quite remarkably all sixteen of his great great grandparents. Each ancestor is given a brief physical description, and former champion show cats are highlighted in red text. It is clear that Shankley is descended from cat royalty on the paternal side of his concise Family Tree. All grown up, at age 4? If you’ve read Where’s Merrill? a genealogical thriller then I would welcome the submission of your considered review at my askDavid author page – just click on the book title link above. Is it memorable ★★★★★ or forgettable ★ ?